Special Engagement Screenings and Events - See theatre website for event details and ticket prices. Tuesday "Bargain Day!" - $6.00: all seats, all shows, all day (plus 3D surcharge, if applicable). Passes are not valid for 3D features. Discounts, passes and coupons are not valid on Friday and Saturday evenings and are not valid on holidays. Discounts cannot be combined. Some Motion Picture Distributors place restrictions on certain movies, particularly for new releases. If you are planning to use a pass, discount or coupon, please check the website showtimes to be sure use is not restricted. Our Gift Cards are valid at any of our three locations. Pass restrictions do not apply. See the "Gift Card" page for purchase details. 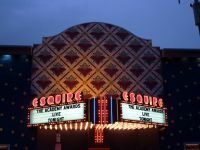 A VIP ticket is a pre-paid admission that will get you into any movie at the Esquire, Mariemont or Kenwood Theatres. However, the $3 up charge for 3D films will still apply. The VIP ticket is not valid for special events and movies presented by outside organizations. Use of the VIP ticket is subject to seating availability. Group Discount for 20 or more - $7.00 each. Contact the Esquire Theatre Box Office to arrange for more details: 513-281-2803 (ask to speak with a manager.) Box office opens 12:30 pm daily. Group Discount for 50 or more - Please email KathyP@Theatremanagementcorp.com for pricing and ticket arrangements. This movie theater is near Cincinnati, Avondale, Saint Bernard, Queen City, Walnut Hills, Anderson, Fort Thomas (KY), Bellevue (KY), Dayton (KY), Newport (KY), Kenton Vale (KY).